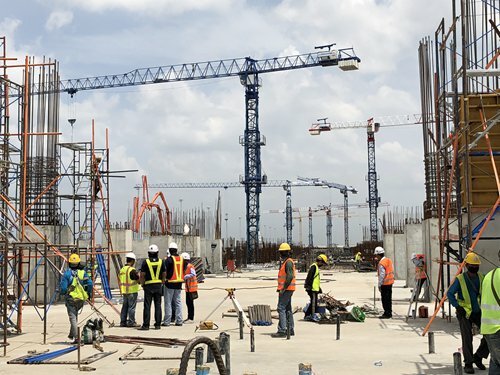 On the underdeveloped peripheries of Bangkok's Suvarnabhumi International Airport, Ali from Senegal is leading a group of workers to install steel structures at a 1.1-kilometer-long extension project site under the grilling tropical Thai sun. In the background, planes take turns to take off and land in a continuous fashion, indicating the busy traffic flow of one of Thailand's busiest airports. In two years, a four-story extension terminal will rise on the site, offering 64 removable boarding bridges, boosting the airport's handling capacity by 15 million passengers a year and ultimately easing its over-crowdedness. "This is the biggest project we have gotten involved in and a very important project for Thailand," Ali, who is a subcontractor working for China State Construction Engineering (Thailand) Co, the local branch of Chinese construction giant China State Construction Engineering Corp (CSCEC), told the Global Times on June 22. For CSCEC, which has just secured the single largest construction contract by any Chinese firm in Thailand - worth $431 million - the job is not easy. But luckily, its 140-strong team has already been fully deployed on the ground in just 8 months. Wang Yinfei, managing director of CSCEC Thailand, said his company's confidence in speedy delivery helped secure the contract, its first major project since 2013, even as Thailand pushes forward with its strong local protective policies. "The construction industry receives strong protection in Thailand. As Suvarnabhumi Airport is working beyond its designed capacity, the owner of the project wants to choose a contractor that can work according to a very tight timetable, so we won the contract," Wang told the Global Times on Friday. Han Xiubo, deputy general manager of the project, said that even as the project is not so daunting in terms of technicalities, it is still proving to be a hard nut to crack. "The difficulties lie in getting things done in the cultural atmosphere of Thailand, understanding how its government works and how to cope with Thailand's industrial supply chain," Han said, noting that cultural collision, communication gaps and execution differences all come into play. For example, since the Thai government requires there to be four local staff members for every Chinese project management staff member, there are often communication issues because not everyone speaks the same language to professional proficiency, whether it be English, Thai or Chinese. After several years of stagnation, the Thai infrastructure industry is experiencing a boom. And all five of China's major construction companies have set foot in Thailand, hoping to get a slice of the country's massive infrastructure drive, including the newly proposed Eastern Economic Corridor (EEC), which the Thai government plans to invest $43 billion in over the next five years. Shen Minghua, project director of the airport project, said there are three airports that help make up the EEC, with Suvarnabhumi Airport acting as the central one. "The success of this project could potentially lead to other airport-related projects. It is a huge market." In terms of playing according to local rules, particularly in markets where a company has to earn its market share rather than working under a State-backed project funded by Chinese money, Da Rui, managing director of Southeast Asia of Chinese heavy machinery maker Sany Heavy Industry (Thailand) Co, shared his experiences in how to build a brand and thrive with local partners. Arriving in Thailand about 10 years ago, Da has been a Sany pioneer in exploring the Thai market. Sany and its Chinese rivals such as XCMG and ZOOMLION have to face the competitiveness of the Thai construction equipment market - Japan's Komatsu has been in the Thai market for 60 years while US-based Caterpillar 40 years. Komatsu's and Caterpillar's cooperation with local Thai agents stretches back decades so their market positions are strongly rooted. "As a newcomer offering similar products, the first thing [for Sany] is to win customer's recognition. And this is not something that can be done overnight," Da told the Global Times on June 21. At the time of Sany's arrival, truck cranes produced by two other Japanese rivals, Tadano and Kato, were monopolizing over 80 percent of the Thai truck crane market, according to Da. However, Japanese equipment in Thailand is second-hand from Japan's home market. "After research, we decided to first enter the market with our own truck cranes, believing this would achieve success in the shortest time. And we were right," Da said, noting that the company gained recognition from clients with products offering more value for the same amount of money. This year, Sany cranes have taken over 80 percent of the Thai truck crane market, replacing the once dominant Tadano, Da said. "When you have a [market] leader in one segment of the market, the company's overall brand gains a boost, paving the way for other equipment manufacturers to make their entrance," Da said. Saasinaat is a sales manager at Maxcrane Co, a leading customer of Sany's equipment located on the outskirts of Bangkok. The company occupies a piece of land the size of a soccer pitch where it does servicing and maintenance work and sells Sany cranes along with other equipment. "As a partner, Sany lends us great support. For instance, when we need some parts, they even send engineers to help with speedy delivery. While many agents for other brands must rely on themselves, we have Sany's strong backup," Saasinaat told the Global Times during an interview in late June. Desire for success in overseas markets such as Thailand has underpinned the company's internationalization drive. In 2017, Sany realized $2.5 billion in overseas revenue, up 30 percent year-on-year, according to media reports. Back at the airport, 24-year-old Supaporn Ineaim, a graduate from the University of Bangkok, works at CSCEC as an administrative assistant and translator. "The Chinese surprise me with their resourcefulness. We Thais often have many plans but few results. But the Chinese can get things done through simple methods. It is all about efficiency," she said. Winning the hearts of customers and building up their own brands have been key for Chinese infrastructure companies to unlock the door to the Thai market. Han said that since they visited the project site in October, they have been figuring out how local and global resources, including inspections and international accreditation, could contribute to the airport extension project. "Our resourcefulness deeply surprises our proprietor. They are shocked at our ability to leave no stone unturned, discovering many resources in Thailand that they as locals cannot," Han said.